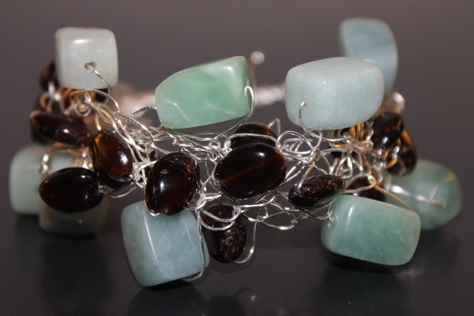 Complete your collection with this gorgeous Handcrafted Pale Aqua Green Amazonite with natural variations in color and Smoky Quartz Bracelet, braided with a non-tarnish silver wire and finished on each end with a silvertone toggle clasp. All pieces are designed by hand, therefore no two items are identical. That's the beauty of buying handmade. The length is 8.5 inches.